So we won't even start to critique the photography here. I know it is pretty bad. Amelia had been having a hard time breathing last week due to aspirating some vinegar. It of course drove me to checking on her a couple of times the first couple of nights. 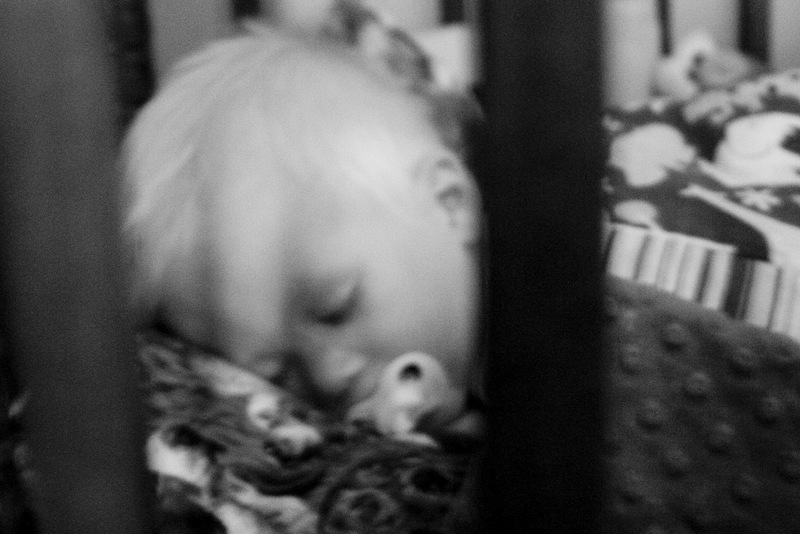 As I went in on this particular night I just sat there and marveled at the beauty of a sleeping child. Josh laughed when I told him this, thinking that I meant that they are not a pain while sleeping, but are when awake. I didn't mean that at all. I don't know if anyone else can put it into words better than I can, but I feel like there is just no distractions when you watch a little one sleep. You are in an environment where you need to be still. That stillness allows for an ability to feel that magnitude of the spirit that is in the little body. I wanted to capture it on film, some way to preserve this precious moment. I couldn't find my tripod or cable release so I had to settle for a wheat bucket and unsteady fingers. I of course woke Amelia up! She is a very light sleeper. As I looked at the pictures, I realized that sometimes a photo just doesn't capture it! Like when you look at the Grand Canyon or a beautiful mountain. There are some pictures that are beautiful, but it is nothing compared to being there! A photo doesn't capture it, but your words do. =) I love sleeping kids too.